Salsola and Inferni established this semi-wild herd of horses in 'Souls, following the Boreas Conflict in 2012. These groups oversaw and protected the herds from poachers and predators until the Inferni-Salsola War. Most are mustang-type horses of the American southwest; they are smaller in size but extremely hardy. A few larger draft crosses are apparent in the herd, but no horse is of purebred origin. They are all grade horses (a horse whose parentage is unknown, unidentifiable, or of significantly mixed breeding) as with most creatures that were formerly selectively bred by humanity. 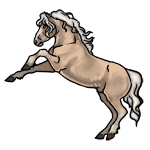 Additionally, as the starting stock of the Bay Horses was of variant breeds, there is a great deal of variation between one individual and the next. There is also no selectivity in wild horses allowed to join the herds. 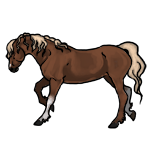 Therefore, the Bay horses are essentially being allowed to develop as they would, forming a "landrace" of horses most suitable to the Maritime provinces. Some of the older horses (ie; those born before 2017) are branded. Average size of 13.2–15.2 hands (54–62 in / 137–157 cm) in height, 700 to 900 lb (320 - kg) in weight. Some bands are typically larger than others. Stocky, muscular, and athletic -- generally with a "rugged" sort of look. Thick coat, long manes and tails. Can be differentiated from most of the other typical wild horses in 'Souls by this feature -- their long hair is very thick and silky. The herd is made up of three primary bands, each occupying a piece of territory between Salsola and The Waste north to Halcyon. Some horses will wander away from these, though as of yet no other bands have formed. About: The "Ghost" band has the highest variability in coloration and consists of sturdy horses, many of the original stock showing vague elements of Oriental-type horse heritage. 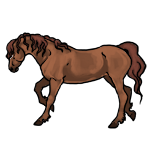 Range: The westernmost horse band generally tends to remain close to the Pictou River, sometimes venturing to the coast and into Salsola's territory. They are wary of most Luperci and quickly became the most feral of the three herds. Winter 2013: A few foals were born, likely holdovers from when the Boreas wolves rode these horses. Summer 2013: A foal was born. Spring 2016: A foal was born. Spring 2018: Two foals were born. An older equine, smart and experienced. Introduced into the herd after the foal round-up in Spring 2014. 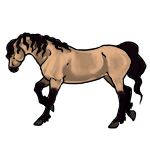 About: The Ash herd was designed to produce a quick, sure-footed horse. 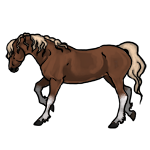 These equines typically have the sleekest appearance of the Bay Horse bands. They have a somewhat limited coat coloration probability, with black bearing the highest probability. 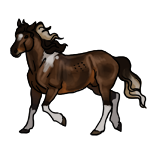 Range: These horses range through the flatlands of Drifter Bay and are frequently seen around the Sunflower Sunsets area. Summer 2013: One foal was born. Spring 2014: One foal was born. 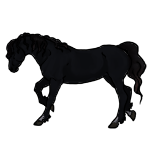 Late Winter 2016: A horse was captured by Salsola members. Spring 2018: Two foals are born. Born into the Ghost band, later joined the Ash band. 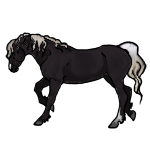 About: The Smoke herd has the largest stallion and the largest mares. 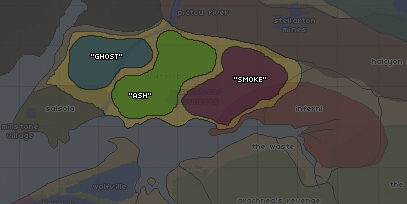 Range: The Smoke band remains close to Inferni's westernmost border, frequently seen along the coastal areas of Drifter Bay and into the border of the coyote pack. 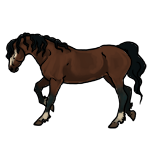 Their experienced stallion sometimes leads them close to the mountains and the fertile grazing along the foothills of the Halcyon Mountain peaks. Fall 2012: A dark bay mare joined up with the herd. Spring 2013: Rémy Lebeau releases a mare to join the herd. Summer 2013: Two foals were born. Fall 2014: One foal was born. 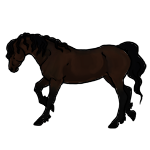 Winter 2018: Inferni captures many of these horses. 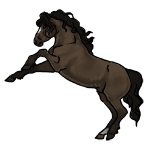 The remaining horses, without a lead mare or stallion, become scattered. The band reforms under a new lead mare. Spring 2018: A new stallion takes over the small band. Previously owned by an ex-Inferni member, Machiavelli disappeared in the autumn of 2015. He returned years later to his old haunt, and took over the herd of wild horses which remained. Machiavelli is a personal NPC -- please see his allowed usage before directly referencing him in threads. The Boreas Conflict occurred, pitting Salsola and Inferni against a group of anti-coyote wolves. After some months of struggle, the packs were able to vanquish their attackers, leaving them free to loot the spoils. 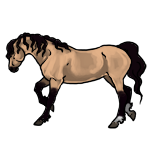 As the Boreas wolves had many equines of good stock, Salsola and Inferni's leadership (Ezekiel de le Poer and Sirius Revlis) came to an agreement regarding the horses. Some would be taken by each pack as spoils, and the rest would be released to roam between their two pack territories, over the Drifter Bay. The pact included provisions for the horses' future care and protection, design and application of the brand, and the later recapture of horses by both packs. This agreement was kept in place by their predacessors, as Inferni's Myrika Tears and Salsola's Salvia Eternity further cemented their trade agreement. The horses thrived, but did not reproduce to the extent expected and so after a sucessful first roundup the groups never reorganized another. They continued to oversee the horses. 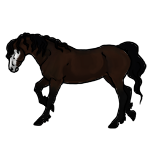 During the Second Boreas Conflict, a number of horses were captured and consumed. Disagreements over rights to these animals occured, and would become one of the catalysts that drove the Inferni-Salsola War forward. Though largely unaffected by the conflict, in the immediate aftermath members of Inferni, under the new leadership of Vicira Tears, captured many of the horses from the Smoke Band. Vesper defends the Drifter Bay horses from a poacher, with a little help. Vesper defends the herds again. Helotes Lykoi tracks and observes the drifter bay horse herds. Draugr Helsi checks on the horses. Salvia Eternity checks on the horses, and warns a loner about them.